It’s guest post day here at Duct Tape Marketing and today’s guest post is from Alexandra Skey – Enjoy! It’s not our fault that most of us associate marketing automation with complex campaigns run by advanced marketers in bigger companies. That’s how it took off in the last decade. We know content marketing works. We also know that more information is being created every 48 hours than the entire amount we made before 2003. So, every 2 days it becomes harder to create content to engage people, especially those who are interested in what you do and are likely to become your customers. Roughly 5-7 years ago, a group of companies saw what was happening and did something about it. They were HubSpot, Pardot, and Marketo, among others. These companies knew it would be almost impossible to succeed at content marketing without streamlining the process. So they started automating tasks their corporate clients needed, and combining them in one place. That was the birth of marketing automation platforms. Since the key with any great campaign is delivering the right message to the right audience at the right time, one of the things the industry became focused on was automating emails. Specially, creating complex trigger scenarios so that you could deliver those messages on an individual basis, ideally converting more customers. Now we send over 294 billion emails a day. Unfortunately, that complexity plagues the stereotype of marketing automation. It’s what most people think of when you mention the concept. And while it’s certainly useful for businesses with significant traffic, the cost and time involved is prohibitive for many smaller companies. 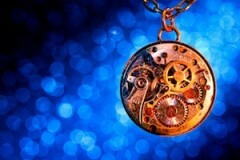 The irony of marketing automation is that it’s viewed as complex and time consuming – yet the goal is to simplify tasks and save you time reaching your most profitable customers. It’s simply a way of automating mundane tasks, so you can be more effective and reserve those spurts of energy for creative projects. Due to the rapid adoption of content marketing, and the associated challenges of creating successful inbound campaigns, it will become more crucial than ever for all businesses to start adapting these time saving techniques. When you use an SEO tool like Yoast to optimize your blog, that’s marketing automation – because instead of learning the rules, Yoast shows you what to do. When you use a plugin to automatically share posts on Twitter, LinkedIn, Facebook and other social channels, that’s marketing automation. It’s not about saving 1 hour by doing something different. It’s about streamlining the process, so you save 3 minutes here and 8 minutes there at every step along the way. With marketing automation, everything counts. The demand from businesses with smaller budgets and time requirements is growing. While the first wave of automation platforms was built for enterprise teams and budgets, we’re now seeing companies like ScribeContent, Orbtr, Spokal, Nurture and others designing platforms specifically for smaller teams, making it easier for anyone to create successful content campaigns. Raab Associates recently showed that over 75% of companies adopting automation platforms in the USA are now small and micro businesses. 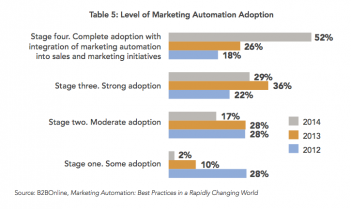 And B2B Online shows that over 50% have fully integrated automation into their marketing. As it becomes easier for small businesses to leverage tools to make their content better, it will become easier to create better content. This means the quality of content that businesses need to produce to attract potential customers (and nurture them over time) will increase. This is fantastic news for customers. And it’s good for small businesses too, because those who can implement time saving techniques into their marketing practices now will have an even better chance of getting ahead of their competition and succeed at doing what they love. Automation leads to great things. Alexandra Skey is the co-founder of Spokal, an award winning marketing automation platform for small businesses, and author of Zero Friction, which explores the future of online retail and will be released in fall 2014. She lives on the west coast of Canada and is obsessed with customer experiences, horses and kiteboarding. You can connect with her on Twitter.